All attendees are required to check in at the registration desks, located in the hall of the Nautical Faculty of Barcelona on Tuesday and at the entrance of the Auditorium room at the World Trade Center on Wednesday. Your registration voucher will be required. Participants are kindly invited to always wear their personal badges in the conference area. Access to coffee breaks, lunches and to technical sessions will be denied in absence of the badge. Accompanying persons are not allowed to attend technical sessions. The 19th AGA IAMU will be held at the Nautical Faculty of Barcelona (FNB) and the World Trade Center Barcelona which is in the heart of the city, between the Southern end of the famous “Ramblas” and the Mediterranean Sea. Barcelona School of Nautical Studies is located in the Pla de Palau, in the city center and next to the port, which establishing an excellent location. By bus: 14, 39, 45, 59, 64, D20 and V15. 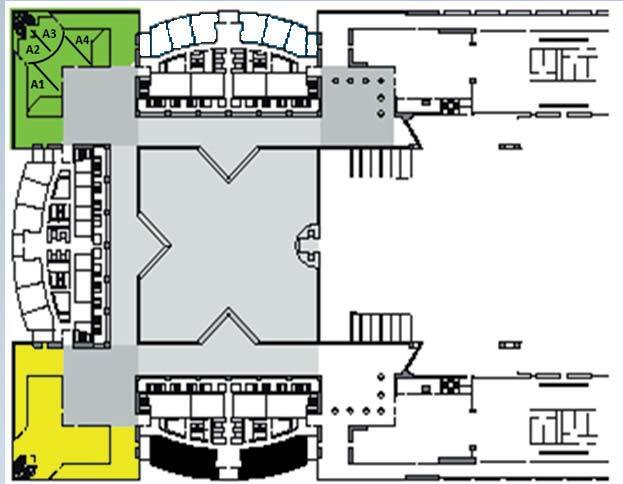 We are going to use the Auditorium, the room A1 and the room A4 located on the ground floor. Coffee Breaks and lunches will be served in the Port Vell Room, where the Poster sessions will be held.